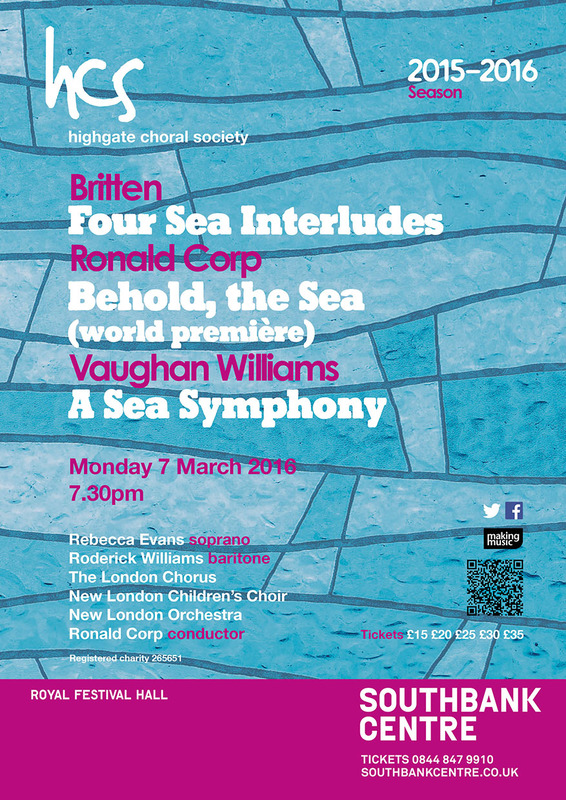 On Monday 7 March 2016, Highgate Choral Society belatedly celebrates the 65th birthday of its conductor Ronald Corp with a sea-themed concert at the Royal Festival Hall in aid of Help Musicians UK. 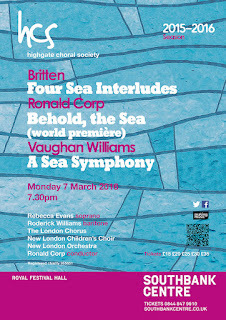 Highgate Choral Society will join with the London Chorus, the New London Children's Choir and the New London Orchestra under Ronald Corp's baton to perform Britten's Four Sea Interludes from Peter Grimes, RVW's A Sea Symphony with soloists Rebecca Evans and Roderick Williams, and the premiere of Ronald Corp's new work Behold, the Sea. Full information and tickets from the South Bank Centre's website.